Glenrothes (pronounced Glen-roth-EZ) is a distillery located in Speyside in Scotland, and at the idyllic part of the world in which they busily ply their trade ten large stills churn out an estimated 5 million litres of new make spirit annually. The new make spirit is then put in oak barrels to mature in one of Glenrothes’ 16 onsite warehouses. Years go by, and when the new make spirit becomes a whisky with a flavour profile Glenorthes wants to release into the market the distillery then bottles the whisky and marks the bottles with the particular vintage year of the whisky, rather than its age. Glenrothes have released numerous different vintages over the last few years – the complex and mature 1988 vintage, rich and spicy 1995 vintage, and, the vibrant and zesty 1998 vintage are some delicious ones! Precisely why Glenrothes use vintage years is beyond me because unlike grapes for example which ripen in response to weather patterns in a particular year and therefore transfer resulting flavours into wine or brandy, the year of barley is harvested or a wash distilled to make whisky really has no bearing on the eventual flavour of the whisky all things being equal. In this review, Malt Mileage has the opportunity to review the Glenrothes 2001 vintage. What matters most to the flavour of the Glenrothes 2001 vintage is not the year 2001, but the oak casks Glenrothes decided to fill with that new make spirit and how long they decided to leave it in those casks. The oak Glenrothes used seems to be a mystery and closely guarded secret, possibly because the 2001 vintage is made according to a recipe rather than taken from individual casks. The flavour profile suggests a variety of cask types were used. With a vintage year of 2001 and a bottling date of 2013 this Glenrothes is about 12 years old, which in my view is a great age for a Glenrothes because I particularly enjoy the distinctly spicy and zesty distillery character of Glenrothes. In this bottling, that distillery character continues to shine unabated in any significant way by the wood despite having spent about 12 years in oak. The bouquet is rich, dense, oily and radiates the zesty and spicy magic that is the Glenrothes distillery character but encased within softening aromas of vanilla, prune, preserved cherries, honey, orange, glazed apricot, custard, pecan pie and some saw durst with digestive biscuits and walnut oil in the foreground. On the palate there is a burst of citrus (orange first and then increasingly lemony) accompanying dark chocolate, spice, raisin and glazed cherry based fruit cake, vanilla and some intriguing wood vanillins. The finish offers the spritz of lemon with the lingering aftertaste of a Vienna coffee topped with nuts and nutmeg, then the sweetness recedes and is slowly overtaken by soft oak and the most curious nip of pinot noir and the bite of a cigar. Overall, the Glenrothes 2001 vintage is an easy drinking dram that beats with a Glenrothes heart of zest and spice, but at the same time showcases interesting layers of oak driven complexity. This bottle won’t last long! 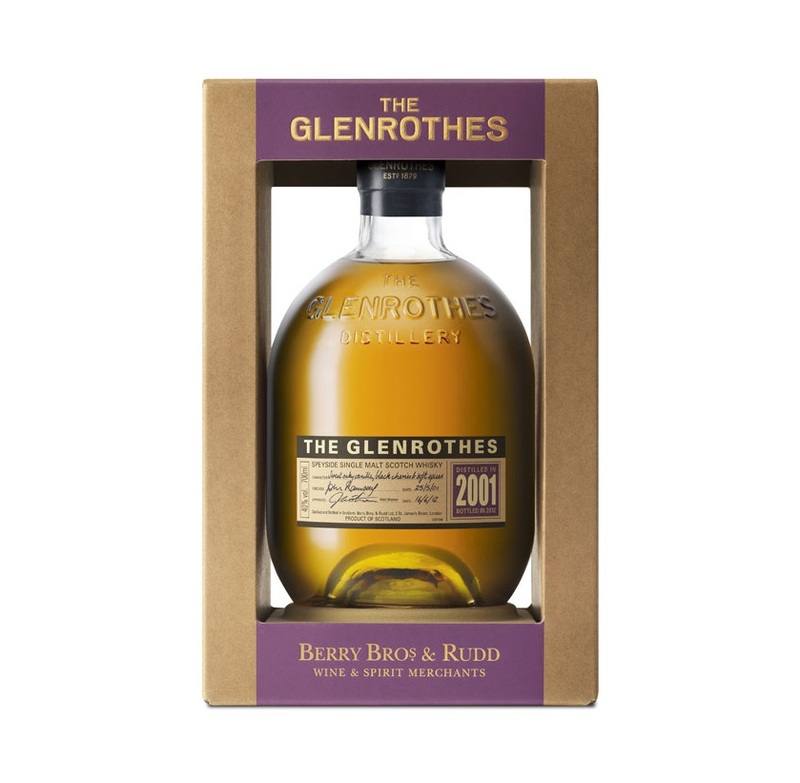 It is my favourite of the Glenrothes range for its beautifully integrated complex flavours – a must buy! This entry was posted in Speyside and tagged Glenrothes, Glenrothes distillery, the Glenrothes. Bookmark the permalink.